One of the major influences upon the development of Modernist architecture in Canada is the famed Finnish architect and designer Alvar Aalto (1898-1976). 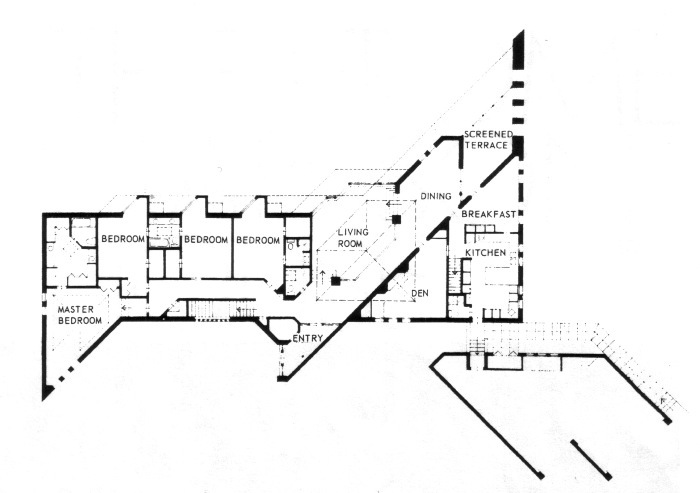 Aalto’s warm, tactile, and often idiosyncratic work, created for an environment similarly cold and dark for much of the year, offered postwar Canadian architects a more humanistic alternative to the sometimes austere International Style. In Toronto, one of the more prominent champions of the Nordic great has been architect Jerome Markson. 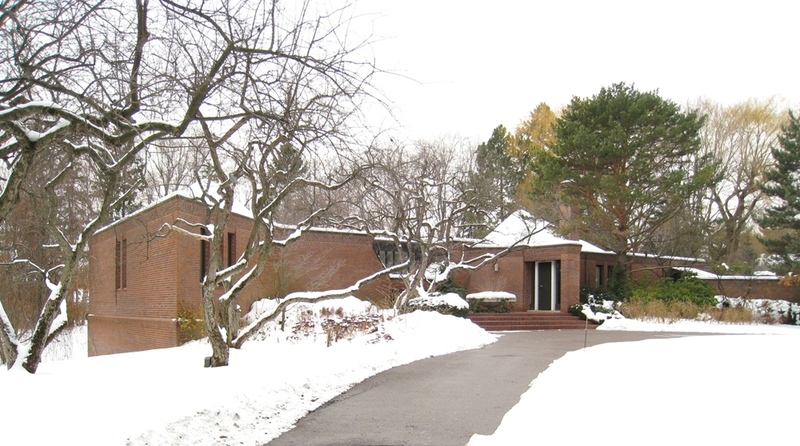 At 63 The Bridle Path, completed in 1967, Markson integrated Aalto’s principles into a sculptural and expressionistic residence for Wilfred Posluns, co-founder of onetime apparel giant Dylex Diversified and a prominent philanthropist. The visual drama of the Posluns house begins with its radical geometry. Markson rotated the living and dining areas 45 degrees off axis, opening the house to the southern sun and introducing a spatial dynamic echoed by the angled master bedroom, main entrance and triple garage. Horizontal bands of brick and wood fascia boards elongate the wall planes, countered by vertical slit windows, a pillar-like chimney and twin peaked roofs in irregular hexagonal shapes. Inside, strategically-placed skylights and smooth white plaster walls and ceilings help to spread natural light throughout the interior, the luminosity offset by purplish-red brick and dark-stained oak millwork. The sunken living room, open to the dining room and entry hall, is visually expanded by a peaked ceiling and glass walls overlooking the gentle contours of the rear lawn. A 1953 graduate of the University of Toronto, Jerome Markson is best known for his innovative yet humanistic residences, multi-unit housing complexes and community facilities. Much of his early work is in Hamilton, and includes a trio of houses on Hamilton Mountain (45, 79 and 125 Amelia Street, 1957-60) and the startling steel-and-glass Moses residence (8 Mayfair Place, 1960). In Toronto, Markson’s residential commissions include the nearby Jack Posluns residence (23 Park Lane Circle, 1962, demolished) and Kofman residence (32 Saintfield Avenue, 1961), and a renovation for future Barrick Gold baron Peter Munk (63 Woodlawn Avenue West, 1961). Notable multi-unit housing and community facilities are Stanrock Terrace housing (Elliot Lake, 1957; Honourable Mention, Massey Medals for Architecture, 1958); Group Health Centre (240 McNabb Street, Sault Ste. Marie, 1963; Massey Medal, 1964); Alexandra Park Public Housing (with Webb Zerafa Menkes and Klein and Sears, Bathurst Street and Dundas Street West, 1967 and 1969); True Davidson Acres Home for the Aged (200 Dawes Road, 1973); an expansion of the Jewish Community Centre and the new Lipa Green Building (4588 Bathurst Street, 1977 and 1981); an expansion of the Civic Garden Centre at Edwards Gardens (777 Lawrence Avenue East, 1975); David B. Archer Co-Operative Housing (160 The Esplanade, 1980); and the Market Square condominiums (80 Front Street and 35 Church Street, 1984). Awarded the prestigious Order of Da Vinci by the Ontario Association of Architects in 2009, Markson is currently practicing as Jerome Markson Architect.